Glitter galore it wasnt just the tailfins that attracted attention to 1959 cadillacs. It was also the pointed, elongated twin-bullet taillights that jutted out from them and the floating jeweled chrome buttons decorating not only the grille but what was called the rear grille. these cadillacs have been cited for front-end vibration, corrosion and poor fit, finish, materials and workmanship. Still, cadillac continued to dominate the luxury market, and one reason may have been the new 390-cu.-in. V8 engine, which in the eldorado reached 345 hp with three two-barrel carburetors. trim fins the sixty-two series for 1959 consisted of two sedans, a coupe, and the convertible. More than 70,000 were sold, including 11,130 convertibles. 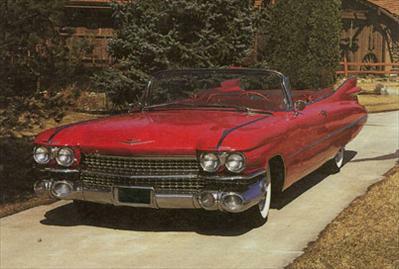 For i960, cadillac presented the same sixty-two series lineup, but this time the tailfins were noticeably scaled down and the rear grille was made less prominent. Sales this year slightly exceeded those of 1959, with 14,000 sixty-two convertibles being sold.